A circle is a boundary of energy extending halfway above the ground and halfway below. 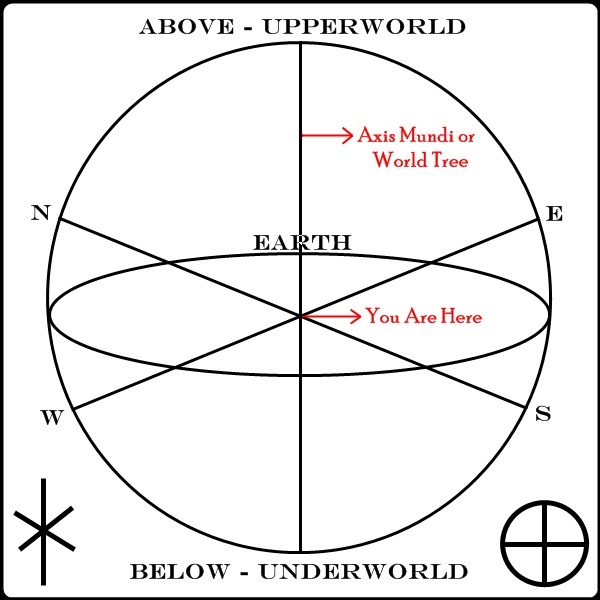 It marks the boundary between the worlds: inside the circle is a cleansed space where the two worlds can interact. Outside is the mundane, 'regular' world. That's the basics; more on this later. A circle is cast to create a clean space in which to do ritual and magickal workings. 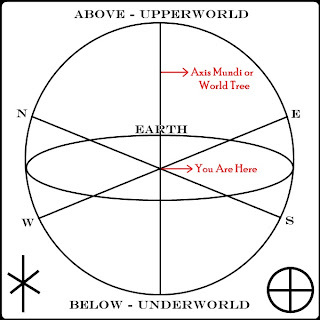 It creates an area in which both worlds are present; in a very real sense, it is between the worlds. To invite a Deity, or an Elemental, etc. without a circle (into the mundane world) isn't always such a great idea. It's easier to interact inside a circle. It also acts to keep magickal energy inside until it is ready to be released, or to keep negative energy outside. 1. What is the purpose of your circle? To protect from outside negativity; to contain magickal energy; to create a space between the worlds; another purpose; a mixture? The nature of your circle will depend on the ritual you are planning on doing. 2. How big will your circle be? If you are casting the circle for practice, then all you need is a circle the size of your own body. For a larger group, no big surprise, a larger circle. In my personal opinion, it should be large enough that you don't keep wandering to the edges and sticking your head through it. 3. How will you visualize your circle? If you are just learning, it might be best to stick with simple colors. Later on, you can learn funky patterns and effects. Practice casting a circle in your mind during meditation. You must learn how to visualize things clearly, hold them in your mind, and focus while you rotate and move them. At the beginning, stick to the basics: there's no substitute for them. 4. Can you keep your focus for as long as it takes to set up the circle? If you are constantly second-guessing yourself, you can't maintain your concentration. Trust yourself. 5. Treat it with respect. Constantly walking in, through, and out of the circle without cutting a door, or otherwise ignoring its boundaries doesn't really help you much. You can't really expect to cast strong circles if you can't create and keep it in your mind first. The circle is real because you make it real. You make it real by believing in it and acting on it. 6. Finally, don't be disappointed if you don't get it the first time. Or the second. Or the 30th. It takes time; it takes self-trust; it takes PRACTICE. I've found that the best time is right after you have cleansed the space (by blessing, sweeping, or making lots of noise), and before you invoke any elements or Deities. If you have others with you for the ritual, save up jokes, and try to make each other laugh really hard just before you create the circle. This further gets rid of any negativity that might be present, and provides enough positive energy to cast a good circle. Well, there are many ways. If you're reading this for information, then you'll probably want a simple one. First, ground and center yourself. Stand with both feet firmly on the ground, and relax your arms at the sides of your body. Simply feel and visualize the energy of the Earth below you, and the Sky above you. Face one of the directions, and physically reach down with your arm and gather the energy of the Earth into your hand. Reach up to the Sky and gather the energy of the Sky into your other hand. Now scoot down near the ground and face your palms outward, sending that energy into a smooth wall of color that will spread itself into the shape of a circle. Rise up as you do this, shaping and smoothing the wall at this corner. Repeat this at the other three directions, constantly smoothing and shaping it with your hands. At each direction, the circle gets stronger and thicker; there are no gaps because the energy of the circle constantly swirls around evenly. See the energy as a thick, fluid stream of color. It also flows under the ground, to even itself out as a complete sphere. You can shape it underground by visualizing it through the floor. Solidify it by visualizing the energy of the circle as sticking together, like hot glue or warm honey. When you feel the circle is 'set', all you have to do now is keep it in mind, and perhaps make minor re-adjustments if you feel it is necessary. Take as much time as you need, and don't rush. No-one's holding a stopwatch. Don't be afraid to move around spontaneously; no-one's marking you on grace or coolness. And most importantly, don't be afraid to screw up; that's an important way to learn. How do I know if I did it? This is the fun part. Everybody has their own unique way of sensing circles. Some people can see the circle; as a band of color, or a thickening of the air. Some people can feel it as a spark of electricity, or again as a thickening of air. Some people can hear it as a low hum. Everybody is different. One thing is certain, however: circles get really hot. In a strong circle you can feel the cold air rushing in when you cut a door. When you take it down, you can practically feel a breeze. In the beginning, you may not be sure whether or not you've succeeded; don't let that bother you. When you really get the hang of it, you'll know for sure. What's this about cutting a door? Cutting a door basically means opening a hole in the circle so you can leave it. It's best to stay in the circle the whole time it's up, but there are times when you've forgotten something important in another room (like a lighter), or there's something you have to deal with. My personal favorite way of cutting a door is to hold your fingers and hand in a straight line, and move your hand around a rectangular outline large enough for you to walk through. Visualize the energy of the circle inside that rectangle being sucked into your forearm where you can store it until you get back. When closing the door, do this in reverse, and then smooth out the edges of where the door was. Visualize the energy of the circle swirling around until the location of the door is lost. Still, cutting too many doors in a circle can also weaken it eventually. At the very end of ritual. After the Deities are gone, the Element/als have returned to their respective realms, etc. etc. etc. The only thing that generally follows taking down the circle is eating, drinking, and chatting. Take the circle down exactly the same way that you set it up, in reverse. Take as much time to take it down as you took to set it up. Send the energy back into the Earth, the Sky, or wherever you chose to get it from. If you used the energy from the Earth and Sky, then it's a good idea to change it into healing energy for our planet and our skies before you channel it back. What's the best way to practice circle casting? Actually: alone. If you can do it alone, then you can do it in a group; it doesn't always work in reverse. Working alone also lets you develop your own style, and you don't need to worry about people staring at you. You can work on your concentration more easily by yourself, and you don't feel like you're boring people if you take a while. Write your own visualizations and keep track of your results in a journal. But above all, learn to trust yourself and your instincts; it's one of the most valuable gifts you can give yourself.